Join the Knights of the Round Table in Excalibur’s Choice, a 5 reel, 10 payline video slot from Barcrest. This slice of Arthurian legend is a straightforward one. The best action comes via the feature round that awards up to 20 free spins. Those free spins come with a special expanding symbol that also pays scatter style. Play on your PC, tablet or mobile from between 10p and £500 per spin. 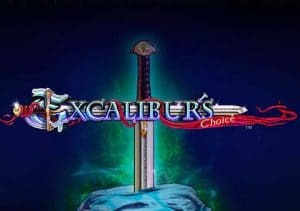 If you’re expecting lavish visuals and a rollicking soundtrack, then you’ll probably be a little underwhelmed when you fire up Excalibur’s Choice. The design here is functional at best. The sandy reels are made up of the usual lower value royal values which have been given a mediaeval flourish. More rewarding are the ring and crown symbols, both of which deliver payouts of up to 50 times your bet per payline. They’re followed by the knight and the castle symbols which offer awards of up to 75 and 200 times your bet respectively. As you might expect, King Arthur himself is the most lucrative symbol. Land 2, 3, 4 or 5 of the bearded monarch in combination and you’ll pocket a reward of some 1, 10, 100 or 500 times your bet. Helping to create those winners is the famous sword Excalibur which is the wild. It pays up to 200 times your bet per payline as well as substituting for all of the standard symbols. The sword also acts as the scatter. Landing 3 sword scatters on the same spin triggers the Free Games feature and with it, 10 free spins. 1 symbol is picked at random before the feature begins. Every time this special symbol lands during the feature, it expands and fills the whole of that reel. This special symbol also pays scatter style so they don’t all need to be in the same payline to create a winning combination. Re-triggers are possible here too giving you up to 20 free spins in total. There’s nothing flashy about Excalibur’s Choice either in design or gameplay. The visuals look pretty dated in fact. The main positives are that the 5 of a kind payouts are pretty chunky. Land a high value special symbol during the free spins and the coins can quickly build. This is by no means an epic video slot. It can be diverting enough though. If you’re not a fan of the theme, then the stripped back nature of Excalibur’s Choice probably won’t win you over. If you enjoy tales of Camelot, then WMS’ Black Knight II is recommended.